The word Aarong means “village fair” and the Aarong brand is meant to invoke a deeper connection to its rural roots. Born out of a humble resolve to empower the marginalized rural women and enable them to realize their full potential, Aarong is one of the 18 social enterprises of BRAC – the world‟s largest development organization. It has been working towards BRAC‟s mission of poverty alleviation through economic development and human capacity building, with a specific focus on the empowerment of women. Aarong was initiated in 1978 as a project to ensure poor silk farmers, block printers and embroiders in Manikganj in central Bangladesh were paid upon delivery of their products. The purpose was to provide a platform for rural artisans where they could sell their products and get a fair market price. Starting its journey with providing employment for a limited number of rural women, Aarong rapidly extended its support by working with many other artisan and crafts. The main objective of this report is to find the practices of business strategies which Aarong would follow to satisfy their customers. I will try to find out what are the approaches are taken by Aarong to establish the strategies as an enterprise. Another objective is to know how Aarong operates its marketing work through the CRM (customer relationship management). To have an overview on performance of Aarong as enterprise and as one of the best retail industry in Bangladesh. To evaluate the business strategies that Aarong follows to stablish its mission, vision, objectives and values. Another objective is to know the customer satisfaction indicators and its result. The study is to diagnosis the key success factor of Aarong being a social enterprise having competition with commercial local and international lifestyle retail brands. This study will also help to learn about managing the country‟s biggest backward linkage for handicraft product production through rural artisans and under privileged producers group. The study will indicate the prospects and challenges of handicraft-based retail sector to promote arts and crafts products. Also it is to diagnosis the technical, financial, operational, creative and organizational competitiveness to produce large number of production, including the identification and targeting of potential markets. Also it will help to learn how the competitiveness being defined here as entrepreneurship, productivity, innovation and investment that produce tangible benefits such as job, good wages, livelihoods, high living standard in both urban and rural areas through organized retailing. d) Identify the competitive business strategies of Aarong. e) Analyze the balance scorecard of Aarong. f) Identify the key success factor of Aarong as a social enterprise. g) Identify the strategic group and market position of Aarong compare to the strategic group. k) Know the customer satisfaction indicators and its result. 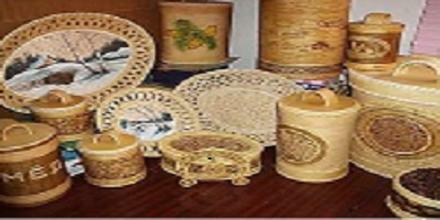 After 1970, Bangladesh‟s handicraft product was introduced in the market. And in 80s the product got market acceptance, and this became its growth period. In the 90s, the handicraft products of Bangladesh experienced a slow growth, and it is the maturity period of the product. After 2000, the sales of product decreased because of its old design and poor quality. Moreover, new competitors came with newly-designed, innovative and quality product. As a result, Bangladesh‟s handicraft product faced a period of decline. But after 2010, it is retained its position and turn back to the maturity stage. There are more than 1000 large scale Handicraft producers in Bangladesh, where only 300 are enlisted with Bangla-craft (the association of handicraft manufacturers and exporters). A large no of handicraft producer sells their good in local market and a few numbers are involved in export. A pioneer in the country’s craft industry, Aarong’s unique product designs have brought consumer attention back to crafts and materials indigenous to Bangladesh, as its designers blend the traditional with the contemporary in a way that continues to win consumer appeal. Its success revolutionized trends and virtually created the market that has now been taken up by countless other boutiques and brands. Aarong caters to this growing urban consumer base through outlets in every major city in the country. Their discerning style and high-quality craftsmanship make every Aarong product unique and demand for them has been consistently rising due to Aarong’s focus on innovation, quality, value-based pricing and superior in-store customer service. All these elements, backed by a robust distribution network and strong supply chain, have made Aarong a true household brand in Bangladesh. Just as Bangladeshis living abroad look to Aarong for products that connect them to their heritage, the Aarong experience is an essential part of any trip to Bangladesh by foreign visitors – a phenomenon chronicled in the “Lonely Planet” guide to Bangladesh. Aarong products are not only the gift items of choice for every occasion for local and expatriate Bangladeshis but also the quintessential cultural mementos for these visitors. Aarong’s growing presence outside Bangladesh – through fair-trade networks in Europe as well as a retail franchise in London – continues to broaden the market for Bangladeshi craft globally. Aarong is a firm that chose the cost leadership strategy aims to lower its production costs by implementing cost reduction through experience, constant cost control, cost reduction in the areas of research and development, advertising, promotion, etc. Having relatively lower costs than competitors becomes the goal of the strategy, although quality of services and other areas must not be ignored. Aarong concentrates its quality and features, and follow the promotional Activities like sponsors on fashion shows, online advertisement, exhibitions to retain its market position in the industry. In the twentieth century firms have realized the cost leadership strategy through mass production, mass distribution and economies of scale (experience curve). In the twenty-first century, however, the focus of managers‟ switches to lean production, restructuring of the organization and outsourcing. Companies are therefore engaged only in those activities which bring them distinct cost advantages, and the rest is being outsourced. Qualitative differentiation strategy is characterized by the creation of a product/service which will be perceived as unique by the customers. This is achieved through design or brand image, superior technology, great customer service or diversified distribution network. This strategy does not allow for ignoring the incurred costs, but they are not the primary strategic objective. Aarong introduced different features in men and women wears like taaga, Jamdani Sari, Khaki Punjabi, Pakistani Luann and such product. Qualitative differentiation is a viable strategy for achieving above than average returns because it creates a defensible position for coping with competitive forces. Differentiation provides protection from competitors in a sense that consumer brand loyalty makes the firm less sensitive to changes in price. This increases the profit margin and avoids the need for setting up a low-cost position in the market. Consumer loyalty and competitors‟ need to fight the uniqueness of the firm provide entry barriers to potential entrants. Interestingly enough, the realization of differentiation will sometimes prevent the company from achieving a high market share, which is due to the fact that the products/services are often perceived as exclusive, which is incompatible with a high market share. This strategy focuses on specific groups of customers, a segment of a product line or geographic markets. The goal is to apply one the two strategies above, but by focusing on serving specifically targeted areas or niche markets. The strategy rests on the assumption that the firm is in a better position to serve a narrow, strategically vital area of the market. As a result, the firm achieves qualitative differentiation through better solutions for the needs of specific targeted areas, or lower costs in serving these areas. Aarong also differentiates its market in all segment like men, women, children, foreigners and all generation people. Focus on empowering poor rural women: From its inception, BRAC focused mainly on rural women, by making small loans available to them for incomegenerating activities that enabled them to take charge of their lives and make improvements for themselves, their families and their communities. Today, more than 98 per cent of BRAC’s borrowers are women. Making a significant difference: The national scale and impact of BRAC’s antipoverty interventions are what makes BRAC unique in the development community. Social enterprises and long-term financial sustainability: In addition to BRAC’s core programs, it also runs commercially operated, pro-poor enterprises that are strategically linked to its development programs. These enterprises form the crucial value chain linkages to increase productivity of assets and labor to reduce risk for the poor. BRAC’s enterprises range from agriculture and dairy farming, to water sanitation, handicrafts and fashion through Aarong. The enterprises also help to make the organization increasingly self-sustaining. Competitor analysis in marketing is an assessment of the strengths and weaknesses of current and potential competitors. This analysis provides both an offensive and defensive strategic context through which to identify opportunities and threats. Competitor profiling coalesces all of the relevant sources of competitor analysis into one framework in the support of efficient and effective strategy formulation, implementation, monitoring and adjustment. Aarong has its own version of the competitive analysis and its function is clear: to line up your product with other products and show where yours falls short and where yours is superior. Each industry brings a different spin to this old favorite and user experience design has its own set of criteria by which to judge competitors. Aarong has competitive advantage over its competitors on almost every factors. Only few companies have ability to chase some sort of advantage like Aarong. Such as Anjans‟s product features, qualities and innovativeness, Kay-Kraft and Anjan‟s supplier, Rang‟s color. The launch of an e-commerce website is Aarong‟s latest initiative to provide greater market access for marginalized Producers in rural areas. Consumers globally will be able to experience the rich cultural craft of Bangladesh through the convenience of purchasing products online. Aarong joins the first wave of retailers in Bangladesh to offer online shopping to its customers. The website features products from all Aarong product lines. Shoppers will be able to view the product and instantly purchase items 24 hours, 7 days a week. Cash on delivery, credit cards (VISA & MasterCard), and b-cash (Bikash) are all accepted forms of payment. The items will be shipped directly to any address within Bangladesh through courier service, and soon extended globally. Additionally, customers are able to exchange or return the product if they are not satisfied at their nearest outlet. It creates competitive advantage among the competitors of Aarong by creating online shopping strategy. Strategic group is a set of business units or firms that pursue similar strategies with similar resources. For Aarong there are many strategic groups in same industry. Like Deshi-Dosh, kay-kraft, Jatra, rang are the strategic group of Aarong. Aarong has many outlets compare to its strategic group in terms of price, features, location and also the customer satisfactions. therefore Deshi-Dosh, Rang and Jattra are the strategic group of Aarong according to the market position as well as business strategies. Market position deals with the question, „who are our customer?‟ it refers to the selection of specific areas for marketing concentration and can be expressed in terms of market, product and geographical locations. Aarong follows different strategy to grab the market position compare to its strategic group. Aarong prices its products or services higher than its competition to create a perceived value. Consumers wonder why a particular company is able to sell its product for more or why its fellow consumers are willing to pay more for the product. In the end, it may believe that the higher-priced product or service is worth more. Aarong produce best quality product with unique features comparatively high price than its strategic groups. As a leading brand of Bangladesh, Aarong certainly desires its presence in any mass media. But since Aarong‟s market is defined geographically by the outlets in the four metropolitan Location cities, it‟s not very efficient to go for those mass media that have a significant coverage beyond Aarong‟s geographic market if we compare the cost and benefits. Billboards appeared to meet both the criteria wonderfully. Billboard is a “one to many” type of communication media with a control over the geographic reach through photo-shoot. There are two types of photo shoots for Aarong‟s promotion. Since all the customers come to Aarong for making purchases, marketing communication at outlets is highly fruitful. Keeping this in mind, in store display boards were installed with impressions that have been used on billboards and magazines. Aarong used selected press media as another channel of communication. Since Aarong is a fashion brand, placing advertisements on Magazines, Fashion supplements etc. was expected to be more effective in reaching the target customers. Considering Face book as a very popular social networking media, the billboard impressions were uploaded on Face book Aarong Page and all the members were notified about it. There was a huge increase in the visit frequency of Aarong Page shortly after that. Next, Aarong‟s shopping bag was recognized as a very efficient channel to reach out to the customers intimately. Therefore, a new shopping bag was introduced incorporating the essence of the new brand image – a vibrant orange bag replaced the old black one. This theory is based on the concept that there are five forces that determine the competitive intensity and attractiveness of a market. Porter‟s five forces help to identify where power lies in a business situation. This is useful both in understanding the strength of an organization‟s current competitive position, and the strength of a position that an organization may look to move into. Aarong uses Porter‟s five forces to understand whether new products or services are potentially profitable. By understanding where power lies, the theory can also be used to identify areas of strength, to improve weaknesses and to avoid mistakes. An assessment of how easy it is for suppliers to drive up prices. This is driven by the: number of suppliers of each essential input; uniqueness of their product or service; relative size and strength of the supplier; and cost of switching from one supplier to another. The bargaining power at Aarong is low because Aarong has determines the price of the product for the supplier. An assessment of how easy it is for buyers to drive prices down. This is driven by the number of buyers in the market; importance of each individual buyer to the organization; and cost to the buyer of switching from one supplier to another. If a business has just a few powerful buyers, they are often able to dictate terms. Handicraft based retail industry like Aarong has a strong potential buyers, so they may reduce their switching cost as well as increase the buyers value. The main driver is the number and capability of competitors in the market. Many competitors offering undifferentiated products and services, will reduce market attractiveness. Aarong follow the differentiated market strategy for different segmented customer. So its status in competitive rivalry is modaret. Where close substitute products exist in a market, it increases the likelihood of customers switching to alternatives in response to price increases. This reduces both the power of suppliers and the attractiveness of the market. Aarong may face modaret threats but because of its differentiated market strategy and quality of product customer are not willing to switch to alternatives. Profitable markets attract new entrants, which erodes profitability. Unless incumbents have strong and durable barriers to entry, for example, patents, economies of scale, capital requirements or government policies, then profitability will decline to a competitive rate. As handicraft based lifestyle retail industry encourages new entry, Aarong creates high entry barrier through its high level of quality and brand value. so Aarong has a high threats on new entrance. SWOT analysis is a powerful technique for understanding organizations Strength & Weakness and looking for the Opportunities & Threats it may face. Used in a business context it helps organization carve a sustainable niche in a market. This analysis is mainly based on an imaginary situation. My Aarong Rewards Card (MARC) My Aarong Reward card (MARC) is a scheme to acknowledge regular and loyal customers of Aarong. The mission is to strengthen the relation with the existing and potential customer by enhancing brand loyalty. This program will allow our MARC customers to earn and redeem points on their purchase. This loyalty program can also provide insight on customers spending behavior and offer them the product that they are more likely to purchase. Managers (or other appointed persons) from outlets should inform the CRM of any staff(s) (also submitting their cellular phone number) who are suitable in handling issues related to MARC. Said staffs will be designated as MARC Representatives. In the event that a MARC Representative takes a leave or quits his/her job, the Manager should inform the Aarong Central Service as soon as possible, submitting the name and cellular phone number of any replacement that may have been appointed. New MARC Subscription Forms may be offered unofficially. Outlets should offer Aarong regular but “MARC” customers (customers who don‟t have MARC) the Subscription Form as a special honor to their loyalty. Sales Associates should fill up the form if the customer does not want to fill it up himself/herself. Forms should be filled up with the objective to collect maximum possible information about the customer without causing his/her displeasure. All customers‟ requests, complaints, queries etc. must be sent to the CRM within 2 days by the outlets. Sylhet, Chittagong and Khulna outlets can do so through a courier service if Aarong transportation is not available within 3 days. For accidental delay, MARC Representatives must utilize the “Late Acceptance Request” form. Additional transportation time will be considered for each outlet according to their locations. CRM regularly publishes updates of the Customer Service Status and Card Distribution Status, which is accessible at http://203.100.100.6/crm or http://crmserver/crm It is recommended for outlets to bookmark this page on their web browser. If necessary, outlets may contact CRM or IT for help or more information on this link. Outlets should cross-check with the updates and maintain an Excel file locally. In case of any discrepancy, the MARC Representatives must inform the Marketing Department. After two days, the liability of the cards, which are enlisted in the published list, will be made available to the outlets. Customers should be asked to sign in a registry book as their cards are collected. After the customer signs the book, the MARC Representatives should to record/verify the Name, Mobile Number and Email Address (if available) of the customer and then sign the document to close the entry. A life style customer will earn 1 point. A gold customer will earn 2 points. A platinum customer will earn 3 points. Redeeming points on every purchase at any Aarong outlet. It will be confirmed within the same date of purchasing on the customer`s account. In case of any purchase return, points earned will be deducted during return. However, points can be earned during product exchange or by using Aarong Credit Voucher. Bonus pts on Birthday and wishes for platinum customers. Special gift at festivals e.g. new year gift, Pohela Boishakh gift. From the beginning, Aarong is a fair trade organization dedicated to bring about positive changes in the lives of disadvantaged artisans and underprivileged rural women by reviving and promoting their skills and craft. Reaching out to weavers, potters, brass workers, jewelers, jute workers, basket weavers, wood carvers, leather workers and more, Aarong embraces and nurtures a diverse representation of 65,000 artisans, 85% of whom are women. Today, Aarong has become the foundation upon which independent cooperative groups and family-based artisans market their craft, in an effort to position the nation‟s handicraft industry on a world platform of appreciation and acknowledgement. Government should mostly contribute in this sector. Arrange fashion competition in between the country.